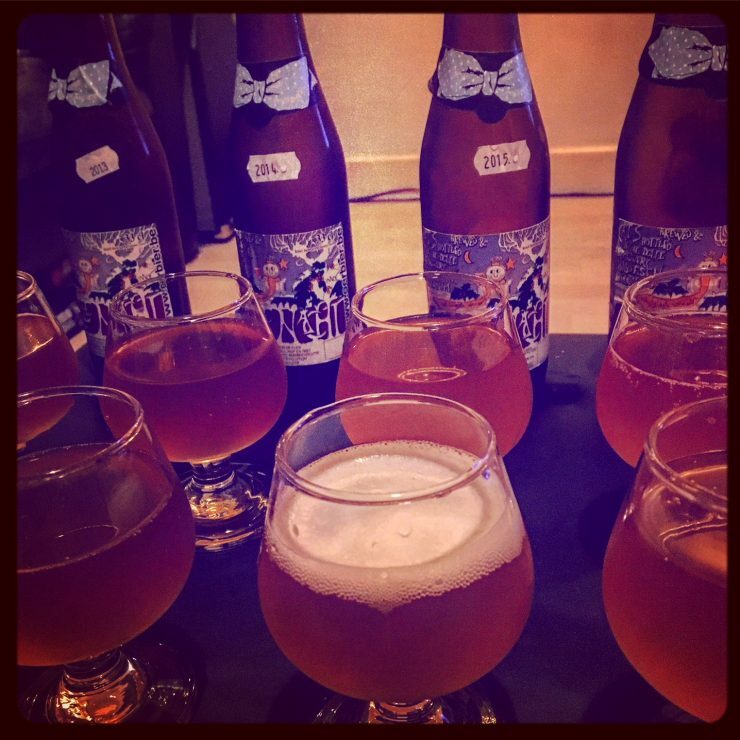 It’s the season to be jolly, and what better way to do that than indulging in festive beers – with a De Dolle Stille Nacht tasting session. De Dolle is one of my all time favourite breweries. 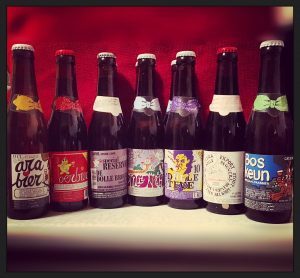 I got hooked after trying Dulle Teve – a truly gorgeo us tripel (the purple bottle in pic). The brewery is based in West Flanders and its impressive repertoire also includes Oerbier, Arabier, Boskeun (an incredible Easter beer) and Special Extra Export Stout. You can spot its bottles a mile off thanks to the trademark bows around the bottlenecks. 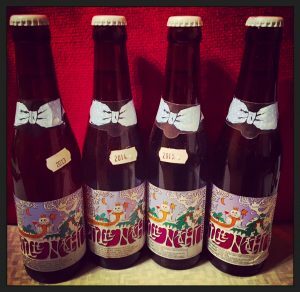 Stille Nacht is its famous Christmas beer which, as you’ve probably guessed, translates as ‘Silent Night’. But your night’s unlikely to be silent if you’ve sank a few of these, as you’ll be far too merry. That’s because this beer – brewed entirely with dry hopped Nugget and boiled for hours with pale malt and white candy sugar – is a whopping 12% ABV. Interestingly it actually used to be 8%, but it now packs a bigger punch due to improved yeast performance. Its other claim to fame is the fact it’s Belgium’s highest density beer. De Dolle only releases a limited amount of this special brew every year and it’s easily one of the most hotly anticipated Belgian winter beer releases. Fans are encouraged to take note of the bottling year of the beer and age it to taste the difference. The brewery itself even held its own tasting session of every bottling between 2000 and 2014 to compare the brews, how they were ageing and explore optimal storage time. I didn’t have 14 bottling years, I had four. And I didn’t have the patience to wait it out and collect more before I sampled them. So I did my own Stille Nacht taste test this month, comparing bottles from 2013-2016 starting with the most recent. It poured opaque and golden with very little head. Its aroma was sweet and sharp and it had a nice fruity waft which smelled like apple to me and maybe a bit of tangerine. When I tasted it, the first thing that hit me was the intense sweetness followed instantly by the unmistakable flavour of strong, strong alcohol on my tongue. The type of intensity you’d expect with a sip of wine but not necessarily a beer. What a difference when this one poured. It was bursting with bubbles, pouring in the way I’ve come to expect with most other De Dolle beers – extremely lively with a generous head of foam. Again the sweet and fruity smell came, and I started to wonder if it seemed more strawberry than apple, but I was probably over thinking it so compromised and put ‘fruit salad’ on my tasting notes. Taste-wise the bubbles enhanced it no end, offsetting the intense sugar hit and distracting from the very alcoholic, almost solvent-like aftertaste of the 2016. Nothing different to report on colour here, but this time there was only the vaguest hint of carbonation as with the 2016. Again the smell of fruit was prevalent and this time I picked up the smell of oranges. It was so hard to distinguish the aromas and flavours, especially drinking them all back-to-back. But I did notice this one was especially sweet – if you were looking for a beer equivalent to a dessert wine this would be the one to choose. Again same delicious appearance and fruity, sweet smell. This one seemed ever so slightly more carbonated than the 2014 but the difference was marginal. Taste-wise many of the same flavours emanated but the one thing I noticed was they had softened slightly. Perhaps I was becoming hardened to the alcohol after the first three but I thought age had made this one even more palatable and an altogether more enjoyable drink. Overall the differences were very subtle but were there nonetheless. As for a favourite, it’s a tough one. I anticipated them getting better with age and I was right… the 2013 was more delicate and I loved it. But I did find myself gravitating back towards my 2015 and I know that’s because of the bubbles. I could almost feel the fizz up my nose when I was drinking it and I liked it. It complemented the heavy, intensely boozy beer perfectly. It was pretty close to call. The 2013 wins on flavour but the 2015 takes the award for mouthfeel. In future I’d like to do this test again, this time maybe trying a couple brewed much further apart – maybe as much as a decade – because I think that would be a great way to to truly assess how the beer changes with maturity.